If a tree falls in the forest, who cares who hears it? For all the talk about the "Death of Privacy"--be that good, bad, or simply inevitable--publication privacy is thriving. Twitter, most famously, offers users only the binary choice of either locking down their entire feed (so that you have to approve requests to "follow" you) or making it public to everyone on the service. But just in the last two months, we've seen a sea change in the ability of users to manage their publication privacy. Facebook announced yesterday that it has implemented the same interface for applications on the site, so that user can exercise the same level of control through the updates that published through the enormous and growing library of apps available on the site, which give users an unlimited number of ways to interact with each other, collaborate, cooperate, share, plan and just play. Google offers a nearly identical interface on the mobile, browser-based version of Buzz (no separate app required)--which is particularly important, because mobile Buzz allows the user to append their location to their Buzz by selecting from a listed business near the approximate location reported by the user's mobile phone carrier. It's also particularly hard to implement this kind of control on a phone, where the limited space requires careful planning of a simple, yet functional user interface. Facebook's mobile apps don't yet offer that, but it's probably only a matter of time before they do. That's the most important part of this story: Suddenly, in just the last few months, we've seen innovation in publication privacy explode--after having gotten used to a world where we had very limited control over the audience with whom we shared information. Both Facebook's privacy change and Google Buzz have drawn significant criticism and both companies are now the subject of complaints filed by the Electronic Privacy Information Center (EPIC), which has relentless advocated for strict privacy regulation. While the issues are bit difference in each case, the common theme has been that critics insist that sharing information can be dangerous. Indeed, for some users, it potentially could--ranging from Iranian dissidents to closeted gays to battered women. Thus, the critics claim, sites must set restrictive defaults so that users have to opt-in to sharing information. Never mind that all users benefit from sites where sharing is encouraged because such sites are more active. Facebook and Google have shown how talented engineers can build in privacy by design that lets users choose for themselves. Indeed, there's every reason to think that they, and their competitors--starting with Twitter but including other sites we might not even have heard of--will continue innovating to offer users what they want: control. The ability to choose between having "sticky" settings (as Buzz does now--same as the last post) and default settings (as Facebook does now--same as the pre-specified default, but not necessarily the same as the last post). Support for the publication privacy controls in the API that services offer so that users can publish content through third party tools like the very popular Tweetdeck (which works for Twitter, Facebook and LinkedIn but not Buzz--yet) while exercising the same privacy controls as if they had posted the content through the site itself. Portability or synchronization of lists: Since both Google and Facebook have converged on the concept of making publication control easy by allowing users to limit access to a pre-specified list, the main limiting factor on the usefulness of this granular control is, of course, the effort required in pre-configuring those lists. 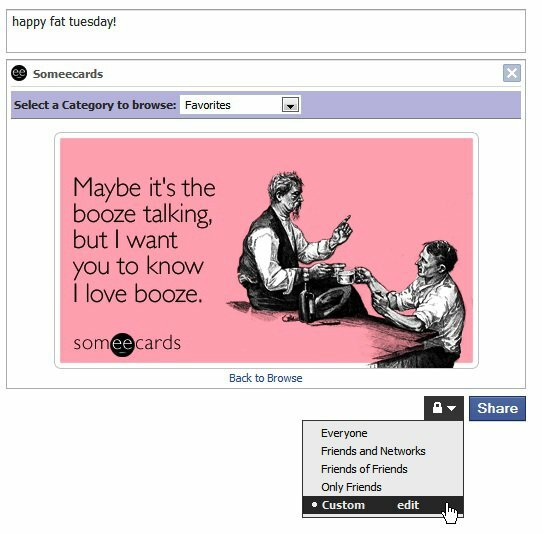 In an ideal world, I'd be able to synchronize my Facebook lists with my Gmail/Buzz lists for those users that are on both services. Despite both companies' commitment to data portability (e.g., Google's Data Liberation Front & Facebook Connect), actually implementing this kind of interface would, of course, be devilishly difficult, since it could open up a new privacy vulnerability by allowing "scraping" of address books. Native syndication features that allow a user who, say, uses Buzz to post their content but wants to "syndicate" it through to Facebook to decide which updates should be syndicated (only the public ones?) and, synchronization of lists were possible, who they should go to (so users could ensure that an item shared with their "family" would only go to that list on both services). Location-sharing can be a very, very useful feature, as the success of Loopt and Google's latitude already demonstrate, because one of the key uses of micro-blogging (e.g., Buzz, Facebook Status updates and Tweets) is to mention that you're out and about at such and such place and you might like let your friends know--or search to see what's going on around you, whether to find a fun party or even in emergencies. But there might be situations in which privacy-sensitive users might want to say that they're in a general neighborhood or even just a city without specifying their precise location. Sure, you could sort of do this now by picking a location that's not that close to you, but this sort of deliberate imprecision dilutes the value of location-sharing for everyone. It would be much better to for users to know when someone is sharing only a rough location. I don't want Buzz to encourage this option, so I'd be happy to see it at the bottom of the list of possible locations to select from when I decide to share my location, but I do think it would be a useful option for some people--and might actually get people to use location sharing who would be uncomfortable with greater precision. There is not yet an official "Buzz This" button for sharing web content along the lines of the Official Facebook "Share This" button and the unofficial TweetMeme button that has become commonplace for Twitter (check out Mashable for examples). If a user clicks Facebook's "Share This" button on a blog post, they get the same publishing controls as if they had simply posted that piece through Facebook. I very much hope the "Buzz This" interface offers the same control, because I might not want to share every article I come across on the web with everyone. 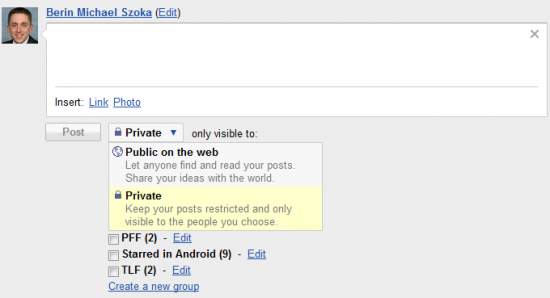 Google should implement the same private sharing option in Reader that it currently offers in Buzz. Currently, Reader users can decide whether to limit access to all their shared Reader items, but cannot do so on a granular basis per post. Facebook has already demonstrated the right way to do this, implementing the same sharing controls for its own "Publisher" tool (status updates) as for applications. Over time, I suspect many of these features will become part of a standard set of features for social networking tools--and expected to be included in new services. But the important thing to recognize here is that no one knows just which features will prove worthwhile to users, or how best to implement them. If we did, perhaps it wouldn't be so hard for the government to dictate privacy by design on high. But we don't know--and the only way we'll find out is through innovation and experimentation. For all the doom and gloom about online privacy, I think publication privacy is only going to improve as Google, Facebook and others compete for our participation in their "Republics of Sharing" (the 21st century successor to the 17th/18th century's "Republic of Letters"). As a tech who routinely repairs computer systems, I'm amazed at the amount of privacy (personal) information clients leave wide open for attack. It's inevitable but people need to educate themselves when it comes to privacy concerns and tracking. 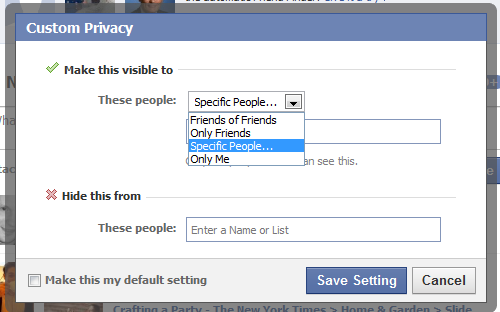 I'm surprised that even when MSM announces Facebook and Apple's privacy issues, it doesn't seem to bother them at all.